“Russia can no longer be considered as a strategic partner, and the European Union must be ready to impose further sanctions if it continues to violate international law” – this is the resolution approved by the European Parliament on 12 Mars with 402 votes for, 163 against, and 89 abstentions. The resolution, presented by Latvian parliamentarian Sandra Kalniete, denies above all any legitimacy for the Presidential elections in Russia, qualifying them as “non-democratic”, and therefore presenting President Putin as a usurper. She accuses Russia not only of “violation of the territorial integrity of Ukraine and Georgia”, but also the “intervention in Syria and interference in countries such as Libya”, and, in Europe, of “interference intended to influence elections and increase tensions”. She accuses Russia of “violation of the arms control agreements”, and shackles it with the responsibility of having buried the INF Treaty. Besides this, she accuses Russia of “important violations of human rights in Russia, including torture and extra-judicial executions”, and “assassinations perpetrated by Russian Intelligence agents by means of chemical weapons on European soil”. After these and other accusations, the European Parliament declared that Nord Stream 2 – the gas pipeline designed to double the supply of Russian gas to Germany across the Baltic Sea – “increases European dependence on Russian gas, threatens the European interior market and its strategic interests […] and must therefore be ended”. 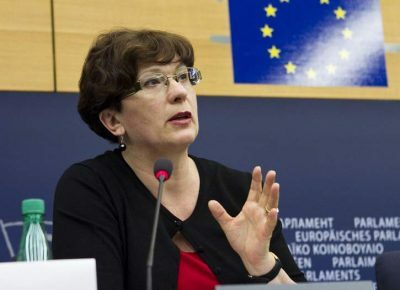 The resolution of the European Parliament is a faithful repetition, not only in its content but even in its wording, of the accusations that the USA and NATO aim at Russia, and more importantly, it faithfully parrots their demand to block Nord Stream 2 – the object of Washington’s strategy, aimed at reducing the supply of Russian energy to the European Union, in order to replace them with supplies coming from the United States, or at least, from US companies. In the same context, certain communications were addressed by the European Commission to those of its members, including Italy, who harboured the intention to join the Chinese initiative of the New Silk Road. The Commission alleges that China is a partner but also an economic competitor and, what is of capital importance, “a systemic rival which promotes alternative forms of governance”, in other words alternative models of governance which so far have been dominated by the Western powers. The Commission warns that above all, it is necessary to “safeguard the critical digital infrastructures from the potentially serious threats to security” posed by the 5G networks furnished by Chinese companies like Huawei, and banned by the United States. The European Commission faithfully echoes the US warning to its allies. The Supreme Allied Commander in Europe, US General Scaparrotti, specified that these fifth generation ultra-rapid mobile networks will play an increasingly important role in the war-making capacities of NATO – consequently no “amateurism” by the allies will be allowed. All this confirms the influence brought to bear by the “American Party”, a powerful transversal camp which is orienting the policies of the EU along the strategic lines of the USA and NATO. By creating the false image of a dangerous Russia and China, the institutions of the European Union are preparing public opinion to accept what the United States are now preparing for the “defence” of Europe. The United States – declared a Pentagon spokesperson on CNN – are getting ready to test ground-based ballistic missiles (forbidden by the INF Treaty buried by Washington), that is to say new Euromissiles which will once again make Europe the base and at the same time, the target of a nuclear war.